I know that tacos are Mexican cuisine and this falls under the umbrella of Asian. 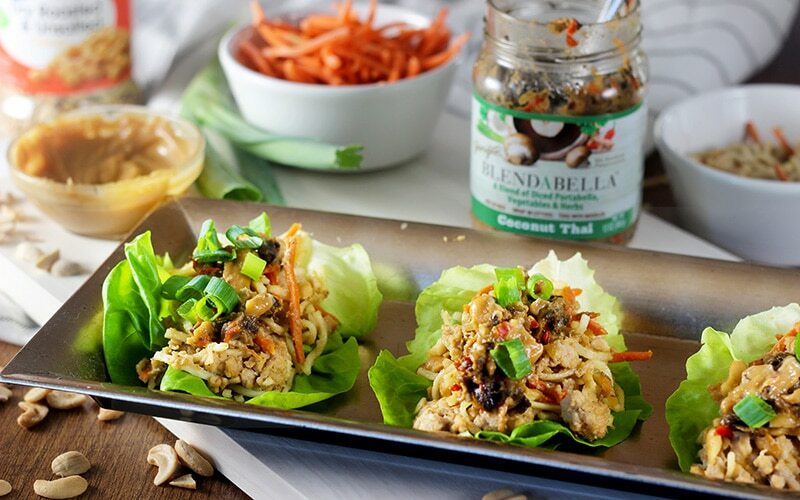 But Thai lettuce wraps are the exception to the rule for Taco Tuesday. If you wanna be fancy and all modern about it we can say that it is a “fusion” recipe. One where you combine or merge ingredients and flavors from more than one food style. 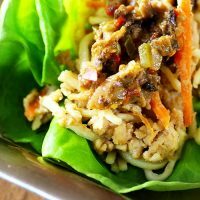 No matter how you categorize them, the main category for these Coconut Cashew Thai Lettuce Wraps is GOOD! Flat out. I was first introduced to lettuce wraps by non-other than my favorite place on the interwebs, Pinterest! I have to admit when I first saw them I thought, “nope not for me”. Then I tasted one that a friend had made and was pleasantly surprised at how delicious they were. And so it began. My cooking inspo comes largely from the food I have had elsewhere and then cater to match my taste, food preferences and restrictions. This is an example of that. I personally use my own homemade peanut sauce, but you can use storebought sauce if you choose and they should be just as good. Not familiar with lettuce wraps? Let me answer a few questions you might have real quick. As for me? My preference is Boston. What's Special About Boston Lettuce? I find that the leaves of the lettuce (is it a leaf? You know what I mean…) work perfectly to wrap up the ingredients of the wrap like a taco and indulge. Furthermore, it’s not too crunchy and doesn’t taste all salad-ey (another made up word of mine) like romaine. So again, a matter of preference. What Can You Put In A Lettuce Wrap? Anything you want. Really the possibilities are endless and you can be as simple or as creative as you wanna be. The ingredients in these give a more Asian vibe. But not all lettuce wraps are Asian-style. This would be a great space to go ahead and give you the recipe. With this recipe, there is flavor, texture, and simply delicious taste. 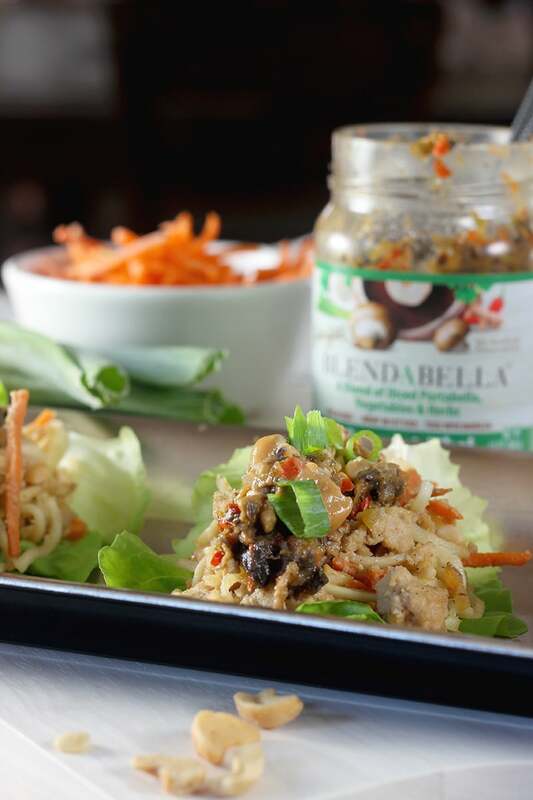 The secret ingredient is the BLENDABELLA Coconut Thai mushroom blend. It packs a slight hint of heat and flavor that tastes amazing. 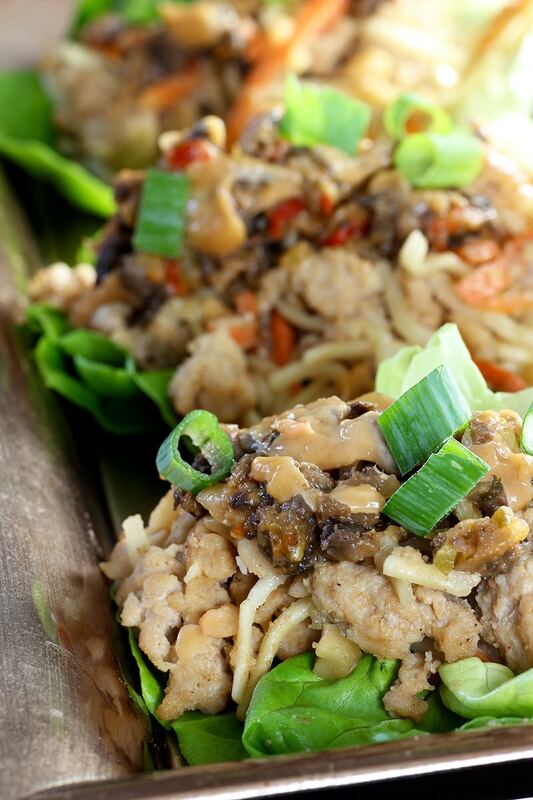 That combines with the smooth and creamy peanut sauce, OH MY GOODNESS! BLENDABELLA can be found directly online and even on Amazon. It may be Asian inspired but my family, who is pretty particular about their Taco Tuesday’s, didn’t mind one bit. If you are looking to add a little flare to the regular menu, this is it! Bring a pot of water to a boil. Cook noodles according to package instructions. Brown chicken over medium heat, season to taste. Add in cashews, carrots and 1/4 cup peanut sauce. Turn down on low. Add in cooked noodles and remaining peanut sauce (1/4 cup). Serve meat mixture over lettuce, top with green onions, cashew pieces, soy sauce, and additional peanut sauce if wanted. You could use ground turkey or ground beef as an alternative. 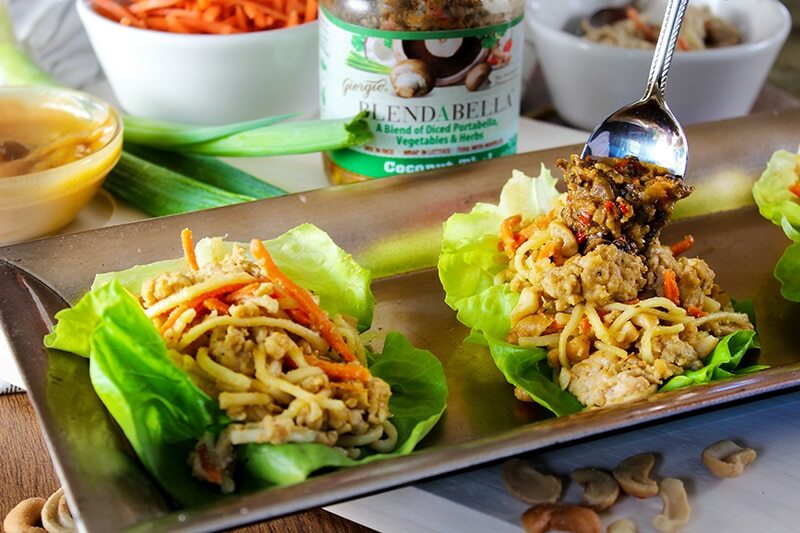 Interested in making these Coconut Cashew Thai Lettuce Wraps for later? Pin and even share with friends using the buttons below!